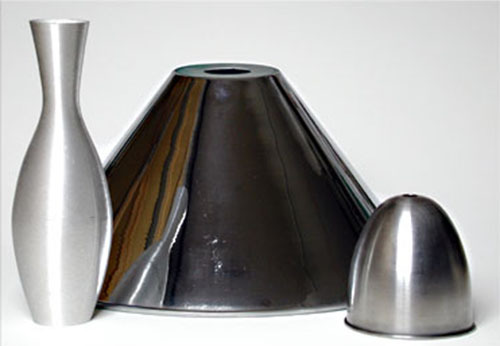 L.P. International is your source for Spun Metal Components. Over the past forty years LP International has produced custom proprietary components to customer specification in its Los Angeles shop and through its trading partners offshore. Working with steel, brass, aluminum, stainless steel and copper LP International can combine multiple fabrication capabilities (metal forming, welding, stamping and tube forming and fabrication) to create assemblies and subassemblies. Finishing in plated as well as powder coated materials allows our customers the advantage of receiving turn-key finished products to their specifications. When it’s time to transition to High volume, stamping and spinning are available through our offshore Factories. (See Metal Stamping Page) All the same value added operations are available through LP International’s trading partners in China and Taiwan.